You get dirty when you work, right? This workwear is crafted with a black bottom to hide some of that dirt, while the rest of it is designed to keep you safe. When you wear an Occunomix LUX SSETPBK Y Yellow High-Visibility Black Bottom Moisture-Wicking Shirt, it's ... (see full details) (see specifications) #LUX-SSETPBK-Y. You get dirty when you work, right? This workwear is crafted with a black bottom to hide some of that dirt, while the rest of it is designed to keep you safe. When you wear an Occunomix LUX SSETPBK Y Yellow High-Visibility Black Bottom Moisture-Wicking Shirt, it's business up at the top and great looks down at the bottom. This ANSI Class 2 Occunomix shirt is a little more stylish than your average high-visibility garment. This bright yellow shirt gives you high-vis safety that's enhanced with 2-inch silver reflective tape. The material reflects light even in low-vis conditions. One horizontal stripe and two vertical stripes help you stay lit up, and that keeps you safer. The material of this hi-vis shirt is 100% ANSI wicking Birdseye polyester that resists wrinkles, dries quickly, and stands up to harsh wear and tear of your job. In addition it wicks moisture away from your skin, so you stay less sweaty and cooler, especially when you're working hard. This shirt in manufactured to be lightweight and breathable, perfect for hot summer days on the job site. A left chest pocket completes the design to add convenient storage space for your small essential objects, such as your phone, pens or a rag. You can even have this workwear custom embroidered by the Working Person's store! So stay safe in this Occunomix LUX SSETPBK Y Yellow High-Visibility Black Bottom Work Shirt, and work the right way. Order your favorite tee online today. Please note additional pricing for larger sizes. MY HUSBAND RECENTLY PURCHASED A FEW OF THESE. ITS A MOISTURE WICKING MATERIAL, WHICH IS WHY IT SEEMS THIN TO OTHERS. THE QUALITY OF THE FABRIC IS FAR GREATER THAN MESH. EXCELLENT TO DO BLACK HALF UP, MY HUSBAND WILL GET MUCH MORE LONGEVITY OUT OF THESE CUZ WITHOUT THE HALF BLACK THEY GET PITCHED OR USED FOR RAGS ONCE THEY START LOOKING DIRTY AFTER BEING WASHED. 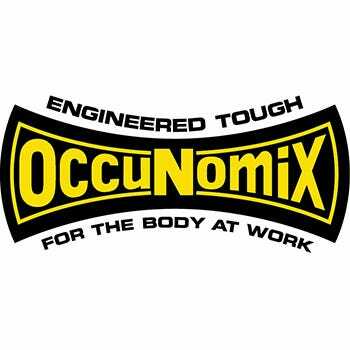 OCCUNOMIX IS FANTASTIC AND KNOWN AS ONE OF THE BEST FOR THEIR HI VIS WEAR. MY ONLY THING WAS IT LOOKS MORE LIKE THE LIME NOT YELLOW, OTHERWISE GREAT AND TRUE TO SIZE. I SUGGEST GRABBING SOME, THEY'LL GO FAST. Shirt seems alright. Except that it is very thin. Almost mesh and likely see through. Depending on your feeling about being somewhat see through, you may still want to wear an undershirt. Would be good for road work and on very hot days. I bought my Occunomix shirt on sale and think it will be useful in the summer heat. I ordered a few of these just before summer and was sure glad I did. They are very comfortable and the black fabric on the lower front is a brilliant idea. Really hides the dirt and grease I get on me from hanging off the side of rail cars. I would order a size up though because they seem to run a bit small. Found out about the sight from fellow employes and bought the Occunomix shirt. Its osha approved and is a good looking shirt. I work out in the HEAT and this is nice and thin.I would recommend this to any person that works outside and highway work. this is a great shirt and safe all in one, its thin like a wickering mesh to keep the sweat away from your body, i would recommend this shirt to anyone required to were a vest, its durable and holds up to every day construction abuse. the black is also convenient to hiding dirt. i would buy more of these for myself. You are great people! I received my boots today, they feel very comfortable. I was worried that I would not receive the boots in time for my ride but you guys made it possible! Thanks a million! Occunomix Shirts: Men's Yellow LUX SSETPBK Y Hi Vis Black Bottom Work Shirt is being added to your cart.